I love to tell stories on the web, taking data and shaping it into something compelling through analysis and visualization. I work as a robotics engineer, have co-founded a startup, and have a degree in physics. I'm always looking for interesting projects to work on, so if you'd like to work with me you should get in touch. A post on bugbucket.io outlining a JSON Web Token based, email-only authentication scheme that I used for that application. BugBucket is a Github app that allows private repositories to open their Github issues to users outside of their organization. It is intended to provide a lightweight way for companies to manage user feedback, bug reports, and feature requests. LakeBrite is a 7,500 node, 3D LED matrix installed at the ECHO Center in 2015. As the first "programmer artist" for the installation, I helped design the interface to the LEDs as well as developed the first handful of data visualizations used in the 24ft x 9ft x 5ft display. How I used National Weather Service data and imagery to make a network of twitter bots that post regional radar GIFs with improved palettes and projections. The HTTP/2 specification was approved on February 18, 2015 and implementation has already begun. In this post, I explain how HTTP/2 will be negotiated in today's web. A data visualization that allows users to compare the snow depth on Mt. Mansfield for a particular season against the historical record. This chart was used as an example of an effective visualization in "Good Charts" by the Harvard Business Review, was retweeted by Edward Tufte (who wrote the book on data visualization), and was shared by the Washington Post on their "Know More" blog. A network of 15 Twitter bots that tweeted animated radar GIFs every 2 hours (until I shut down the service in April 2017). I took static NWS images, changed the projection, basemap, and palette—making it color-blind friendly and more intuitive—and strung the images together into GIFs. 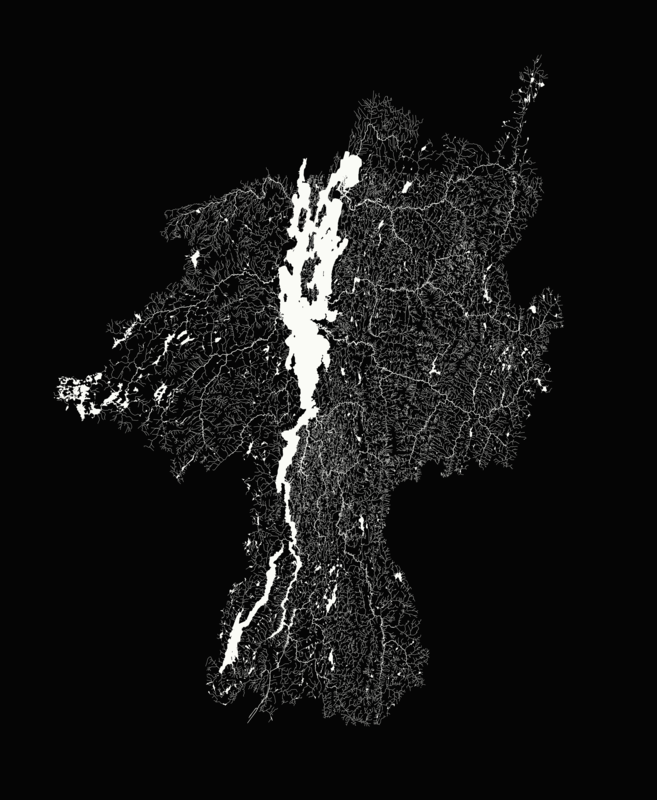 A map of my home, the Lake Champlain Watershed. Published occasionally by VPR and printed full page by the Burlington Free Press on January 3, 2016. Full resolution PNG (for screen) and JPEG (for print). The homepage for VPR's web-only music video series, a la Tiny Desk Concerts. A data project for Vermont Public Radio on the growth of Lyme Disease over the last 15 years. Includes an interactive bar graph of New England and small multiples of Vermont and the continental United States showing the infection's expanded range. Published in the open with links to the data. A crowd sourced interactive map of the international volunteer efforts of Vermonters; complimenting a Vermont Edition segment on the same subject. A news app that explained how Vermont Health Connect works and—when it didn't—showed where it was broken. A hackathon project that created a personalized livability map of Vermont towns.